For years Steve Borek had provided personal coaching through "End Game Business" to help people create a better life for themselves personally and professionally. He had a long list of satisfied clients who’d found happiness through his guidance. Always searching for more life lessons he could offer his clients, Steve discovered the “NOW WHAT®, 90 Days to a New Life Direction” program. At first he was skeptical. But the more he immersed himself in the reading material and exercises, the more enthused he became. This program embodied the very concepts he’d espoused but in a more focused and results-driven way. Steve already had a website that promoted End Game Business, his career coaching service. But he wanted to create a specialized site that was wholly focused on the “NOW WHAT” program. He had to convince prospective clients that he could take them from the ho-hum life they currently had to the richer, more meaningful life they desired. Susan Greene worked with Steve to create a website that described the “NOW WHAT” program and the many benefits it could provide to individuals seeking a more fulfilling career. The site had to give clients confidence that Steve was a highly trained facilitator of the program and knew how to get results. It was also important to Steve that the site convey that what he offered was no I-Dream-of-Jeannie solution. Clients couldn’t expect to simply cross their arms and blink their eyes to solve their problems. But with the right coaching and some hard work, they could dramatically change their life for the better. Steve Borek launched his new site and began promoting it through his blog, personal contacts and social networking sites. Almost immediately he received inquiries and was soon filling up his schedule with new clients interested in the “NOW WHAT” program. Besides helping to grow Steve’s business, the new direction of his coaching was personally fulfilling. “My passion is helping others.” The new website enables Steve to reach out to more people and guide them in changing their life for the better. I love the copy you wrote for my new website. 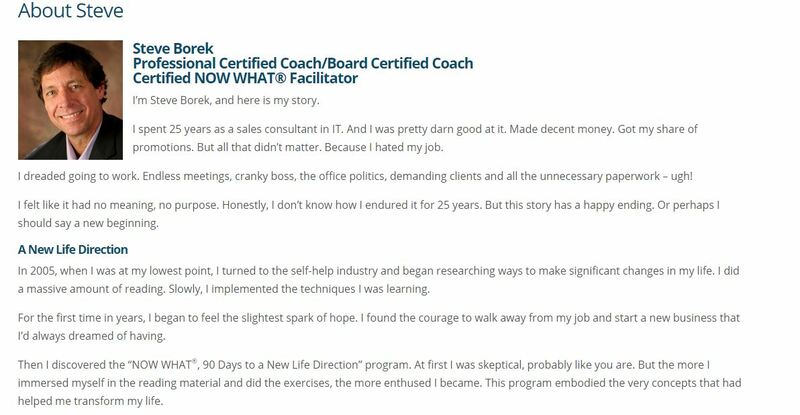 You did an incredible job explaining career coaching and my new 12-week program, "NOW WHAT®, 90 Days to a New Life Direction." Do you need a website to promote a specialized product or service you offer? Contact Susan Greene, website copywriter, today!